I thought I'd post things in here from time to time of personal projects. I had some time off from work recently and made the Ecto-1A from Ghostbusters 2. I'm currently adapting the equipment on top to represent the Ecto-1 from the first film. I'm also rendering the image for a 5 foot by 3 foot poster. I doubt I'll be allowed to hang it anywhere but my office. Will post more images as they get made! I forgot to say how much I loved your rendition, Briney. The Ecto 2 is all about details and you, sir....nailed it. I love the old tires and the wear and tear on the body. The phone number and the chrome makes it look very realistic. I esp. like the use of the Statue of Liberty in the title. As you were doing all the top work did you ever figure out what all of that does? I've always been curious. It looks like they use a different fuel source with your tubing going into the gas tank area. Do you know what it is? It's awesome you started to do art again that you enjoy. I really hope you keep posting it up for us to see. We've all come a long way from the rocket shadow on the Earth...always been a fan of the GB car...it's nice to see it lifelike again. I agree completely. That is an amazing rendition, Briney! Out of curiosity, do you have the old version you did in high school? It'd be nice to see the "before and after" effect. Ya, throw up some Bryce 3D stuff too! Thank you fellas, I really appreciate the comments! I'll post a few images of the gbcar back in fresh year of college when I get home. Over the weekend I just finished the ecto-1, the first Ghostbusters car. 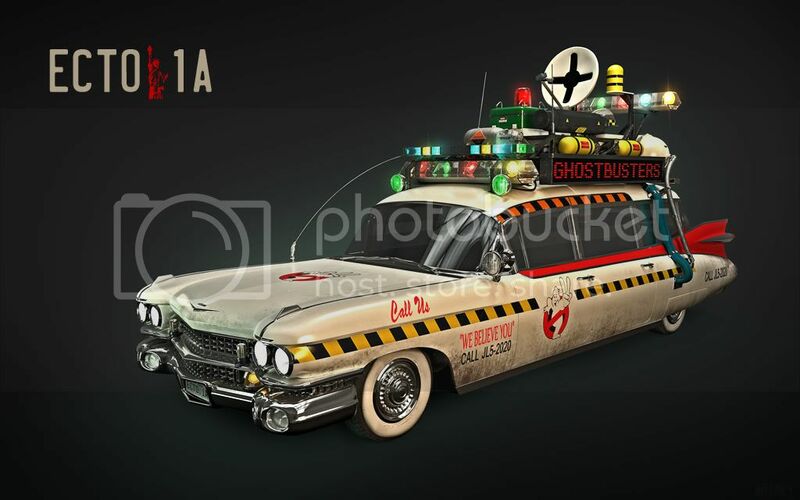 I'll prolly rerender the Ecto-1a with less dirt because it's "newer." I love the work you've posted. I didn't know you got a gig with Field & Stream! That shotshell is amazing! Yes! Thanks for posting up new art Briney, esp. your Pop Sci and other magazine stuff. I didn't know you finished "Frank" up. I like the stubble you gave him. New popsci is out! It has a firetruck and a mens birth control illustration in there! A 2 page spread for their article on climate change skeptics. They censored it a bit in the magazine tho. I haven't read the article yet but I'm sure its biased heh. Couple more recent ones I didn't post yet. Is the last one suppose to be a hybrid of a conventional bullet plus a rail gun? Also, what's the small hook on the underside of the nose of the plane? Is it to cut through the air before it gets to the first set of wings? They look great as always, sir. I'm thinking the "hook" is a pitot tube, but I could be wrong. Pitot tubes are used on aircraft to measure airspeed. Briney, your artwork never fails to amaze. Thanks for sharing! Briney I am so proud of all the crazy stuff I have seen you do, it is amazing, like I said, I really like to see you doing what you like so much.